Circus tube from Danny Lee. Get it from S&CO. Circus kit from Designs By Joan. Get it at S&CO. Adjust, color Balance, Manual Color correct to color #11b5cf. Go to Adjust, Color Balance, Manual color correct to color #804eac. Position at the top of the canvas. Use your deform tool to position under the curtain. Position under the curtain to the top left side of the canvas. Position near the bottom of the curtain layer. Position bubbles along the top of the curtain. Position at the bottom left of the curtain. Position near the top left of the curtain. Position over the bottom right of the pink balloon. Position over the bottom left of the green balloon. Position over the right of Element 24. Position over the bottom right of the curtain. Position over the bottom left corner of the ticket booth. Use your deform tool to position the tickets to the right of the popcorn. Using Freakshow font type out the word WELCOME in color #9d48ec. Add Fat White Gradient Glow of 3. 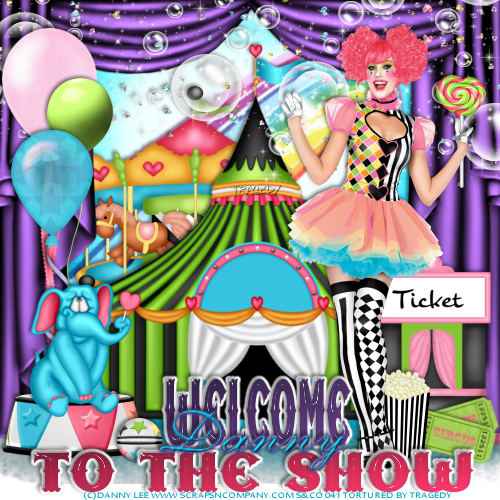 Type out To the Show under welcome in color #e65069. Don't forget to add your copyright & Watermark. To add your name use the Sheer Grace font in color #07a1c0. Add Standard gradient Glow & Dropshadow. Labels: Danny Lee, PTU, Scraps N Co.